Come to me, all you who are weary and burdened, and I will give you rest. Take my yoke upon you and learn from me, for I am gentle and humble in heart, and you will find rest for your souls. For my yoke is easy and my burden is light,~Matthew 11:28-30. 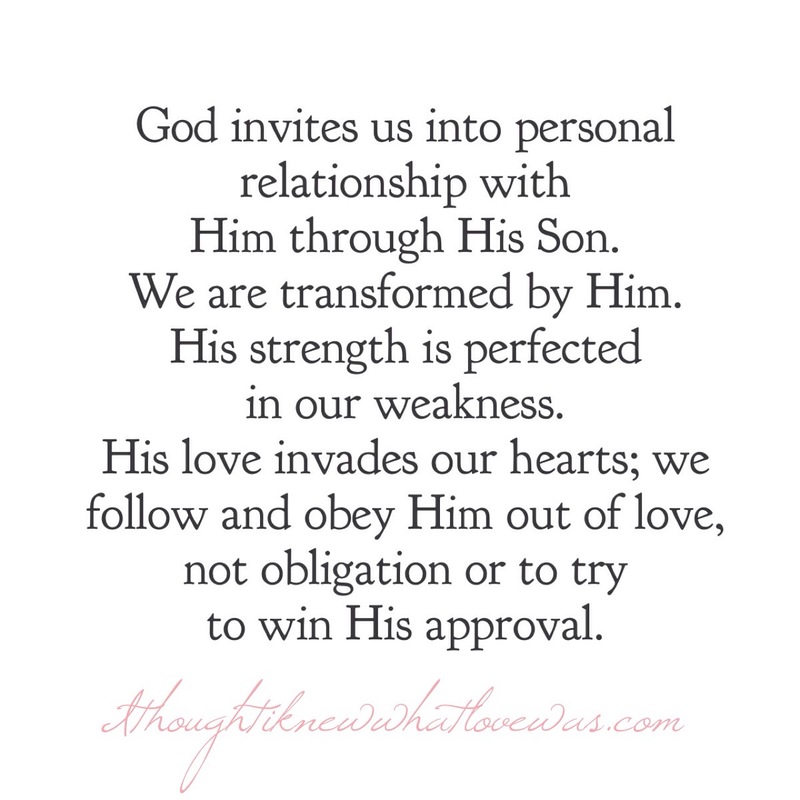 God invites us to know Him. It’s the most beautiful and glorious invitation. The Creator of the Universe, who calls all the stars by name, invites us to enter into the deep places of His heart. Jesus paid the highest price so we could have unhindered fellowship with the Father. In the old covenant only the priests could enter the holy of holies. People died if they approached God the wrong way. He’s holy and there’s no sin in Him. In the new covenant, through Christ, we can go boldly before the throne of God! So, why do so many linger outside the gate? Why are there so many who don’t know God personally? Why are there many who have no personal relationship with God, yet attend church Sunday after Sunday? Why has God been reduced to an enforcer of the rules instead of a loving Father who wants the best for His children? Why are some of our church services void of love, passion, joy, and excitement? I truly believe it’s because we don’t seek God for who He is. We seek God made in our own image, shaped by our worldview, and what we’ve been taught. I am a firm believer and advocate of reading the Bible. It’s a blueprint. God does not violate His Word. I’m also an advocate of knowing the Author and knowing the Holy Spirit. I know many people who know the Bible like a text book and they know about God, yet they have no experiences with God. The Bible is meant to lead us into an encounter with God. It’s not a text book to simply memorize to show others how much we know. The goal is relationship. It’s quite helpful to have relationship when you run across passages that seem to contradict each other. I truly believe some pray a prayer instead of responding to an invitation for relationship. Following Jesus is making Him Lord over every part of our lives. We are not just praying a prayer and then living like the devil for the rest of our lives. That’s not true repentance or conversion. Jesus invited people to follow Him. Demons believe and tremble. They do not have a personal relationship with God, they are not saved, nor following Jesus. I truly believe many come to God for fire insurance. If we are only with God to bypass hell, we are missing the point. God wants to be known and loved. He’s not boring. He’s not cruel. He’s not controlling. He’s the best thing in this world. I truly believe many people don’t know how much God loves them. I know I didn’t. I’m still experiencing as Paul stated, “the height, depths, width, and vast expanse of God’s great love!” I don’t have Him or His love all figured out. It’s a journey to the deepest parts of His heart. Until we receive and know His love, we will struggle with identity, lack of peace, fear, insecurity, lack of joy, lack of love for others…you see, we can’t even love God well until we first receive His love for us. We will obey Him out of obligation and fear instead of love. The more I experience His love, the more love I have for Him, for others, and my concern isn’t breaking “the rules” it’s breaking His heart. He’s the love of my life. We need to know the God we are worshipping. It’s more than a Sunday morning worship experience. It’s a daily communion with God. It’s living life loving God. Will you join me on this journey into His heart? Sweet friends, He longs for us to know Him! I didn’t want to write a book. As an introvert, I’m quite comfy with people not knowing who I am. God prompted me saying, “My children don’t know how much I love them. Teach them My ways.” So, when people say I talk about God’s love too much…well it’s needed. Loved people show you their best. Scared people show you their worst,~Danny Silk. Yes, there will be those who are loved deeply and still reject God. We are not responsible for those people. We are to receive and freely give. We are called to love. Deeper into God’s magnificent heart!